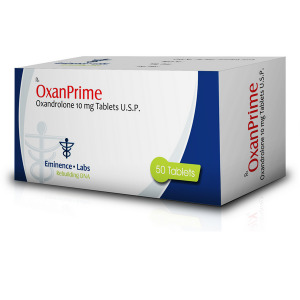 Oxanprime does not give any side effects, if used in reasonable doses. This is understandable, because The drug was originally intended for women and children. This is one of the few steroids that does not cause premature retardation of physical development in children, because it does not contribute to the closure of epophysis compounds; therefore, the drug is used mainly in children to stimulate body growth and in women with osteoporosis. The drug causes (if at all) causes very weak effects of masculinization. This quality makes it a favorite means of athletes, because with a dose of 10–15 mg per day, they rarely experience external manifestations of prostration. Oxanprime is very fond of bodybuilding and powerlifting athletes. This is primarily due to the fact that it contributes to a strong increase in strength. This is due to the fact that creatine phosphate synthesis is excited in the muscle cell and does not accumulate fluid. Weightlifters and security officials who do not want to move into a higher category use this, because the drug gives them the opportunity to become stronger without gaining weight. Good results are obtained by simultaneous use of Oxanprime and 120-140 μg of Clenbuterol per day. Although Oxandrolone itself does not contribute to a noticeable growth of muscles, it significantly enhances the effect of many steroids on the body, it is especially well combined with Deca-Durabolin, Dianabol and various testosterone variants, since the increase in strength that occurs when taking Oxandrolone while taking Deca-Durabolin, Dianabol or testosterone at the same time, which accumulate fluid and promote strong tissue growth, the result is additional muscle mass. The combination of 200mg of Deca-Durabolin per week, 500mg of testosterone enanthate per week and 25mg of Oxandrolone per day causes a good increase in strength and mass in most athletes. Deca-Durabolin has a pronounced anabolic effect and stimulates the synthesis of proteins, Oxandrolone increases strength, and testosterone makes the athlete more aggressive during exercise and accelerates regeneration. The certainly positive features of oxandrolone include the almost complete absence of side effects of this steroid – along with methenolone, oxandrolone is the safest drug. Oxandrolone does not aromatize and in any dosage has no effect on the production of endogenous testosterone, so it can, as already mentioned, be used in between cycles to avoid loss of muscle mass. The only thing that can darken the impression of the drug is the presence of the alkyl group in the 17th position, in other words, oxandrolone is potentially dangerous for the liver. However, as far as I know, the case of liver failure due to the fault of this steroid has never been noted. Another not very pleasant feature of oxandrolone is the ability to provoke diarrhea, this is especially true for the dosages given below. However, diarrhea still occurs in a minority of athletes who take oxandrolone, and even with all the troubles that accompany this disorder, it can not be classified as life-threatening. It should be noted that the normal impact of the drug athletes power sports should be expected only starting with a daily dosage of 50 mg Oxanprime. But even with daily intake of 150 mg of the drug, as they say, without “support” from other anabolic steroids, there is no hope of any significant increase in muscle mass. In between cycles, the daily dose of the drug can be reduced to 30-40 mg. Based on the half-life of oxandrolone at 8-9 hours, its daily dose can be divided into three equal parts and taken at regular intervals.